In the past couple of years microgreens have become a buzzword on restaurant menus and news articles talking about their nutritional content compared to the mature varieties of the same plant. Some early studies show that there may be reason to laud their nutritional content and chef’s put them on their menus because they are delicious to the eye and the taste buds. I grow a number of indoor microgreens (basil, cilantro, mustard, arugula, beets) to add color, flavor and crunch to dishes but you don’t have to set up a grow area to get some microgreens in your diet, you can just repurpose your plant thinnings. This year I overseeded my regular and dwarf varieties of pak choy and basil in my backyard garden because I was using 3 year old seeds and suspected that I would have low germination rates. Surprise, the seeds germinated at a remarkable rate and now I have a whole lot of extra seedlings that will have to be removed to make room for the vigorous individuals to grow to maturity. 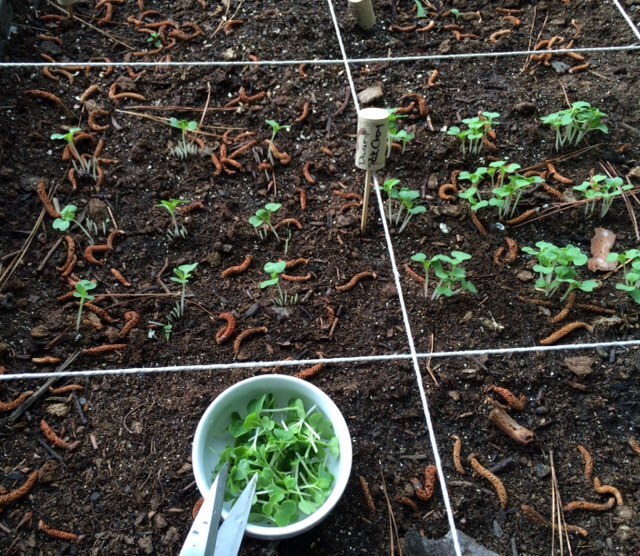 Rather than cut them and toss them in the compost, I let edible seedlings grow enough to be used as microgreens before snipping them down. Below you can see that I thinned one square of the dwarf pak choy that will be used as microgreens today and I will save thinning the square next to it until I can use them in a meal. Waste not, want not! Whether you are just thinning seedlings or clipping microgreens to go into your next meal, be sure to use scissors or a similar sharp pruner to cut the plants at soil level. If you pull on your thinnings, you may damage the delicate roots of the one you have selected to grow to maturity. This entry was posted in Backyard Gardening, Indoor growing, Microgreens, Organic, Square Foot Gardening, Sustainable, Thrift, Urban Farming. Bookmark the permalink.